This Carson MM-22 MagniMark ten-pack consists of portable, handheld, bookmark-style 3x magnifiers that are suitable for daily use. Each magnifier is particularly effective for viewing vertical blocks of text, such as within books, newspapers, or magazines. 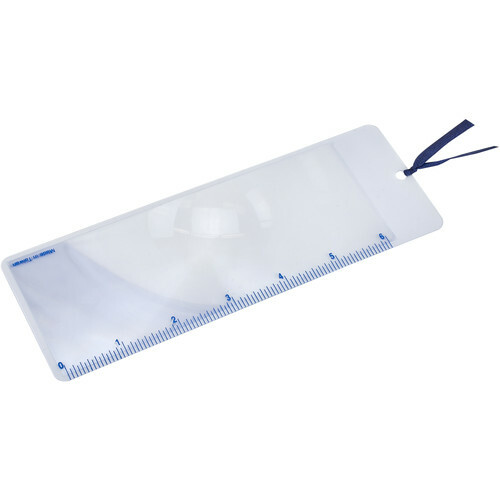 Only 0.1" thick, an MM-22 MagniMark can to be used as a bookmark, and its edge features markings that allow it to function as a 6" ruler with 1/16" increments. A ribbon tassel is tied through the side of this magnifier so that its position is always visible when placed within a book. Box Dimensions (LxWxH) 10.4 x 4.55 x 1.5"